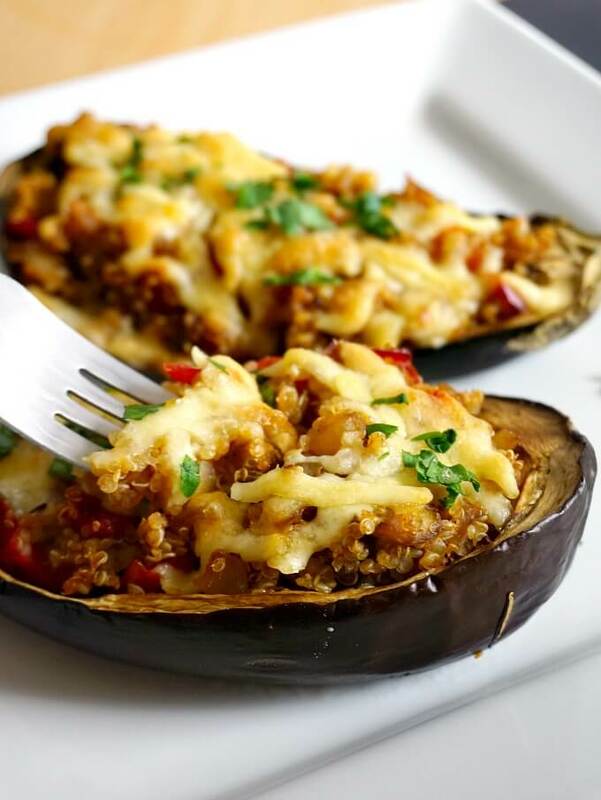 Healthy Quinoa-Stuffed Eggplant, a delicious appetizer that is low carb, low calorie and gluten free. Super simple to make, these stuffed eggplant is a must-try recipe. 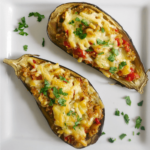 Call them eggplant or aubergines, they are the same fabulous, but awefully underrated veggies, unless you really enjoy the Mediterranean diet and cook with eggplant regularly. There are endless ways of cooking the good old eggplant, from spreads, to canapes, or a hearty Moussaka. In Romania, we love eggplant, especially in spreads or dips. 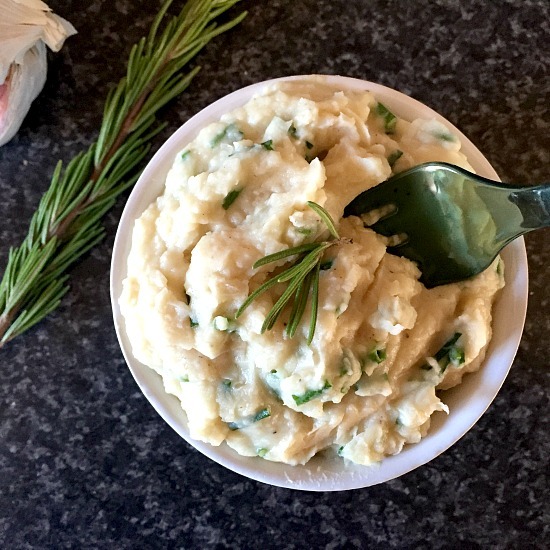 I have grown up having it pretty often, so there is no surprise that I absolutely love it, my favourite eggplant dish being the mayo eggplant dip, which is superbly refreshing, especially in the heat of the summer. This beautifully healthy stuffed eggplant recipe is a fantastic Fall appetizer that uses seasonal produce. 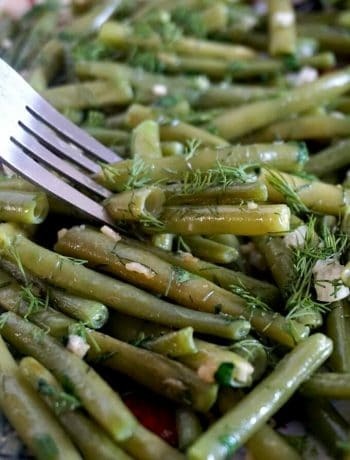 Nothing like a super simple, but so flavourful dish to spoil your taste buds. I can’t believe it’s the first ever recipe on my blog that uses quinoa! Although, I must be honest, I don’t cook with it very often anyway, even though I get that quinoa is a super food with countless health benefits. Some people stick to their usual food, I guess, and if I am to choose, I usually go for rice or couscous instead of quinoa, but that’s not to say that can’t change. I suppose when you have picky kids, you end up cooking the same dishes over and over again, and just give up on cooking something different, knowing that they most probably won’t even touch it anyway. But I am hopeful that they will get to like quinoa too, cooked together with veggies is absolutely delicious. I really like its texture, and that it cooks quite quickly. Stuffed vegetables are the perfect way to make something pretty bland into something spectacular. 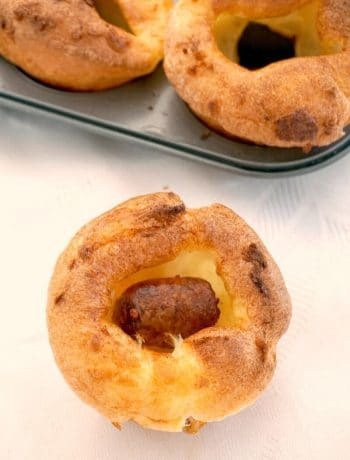 Why not check these recipes too? 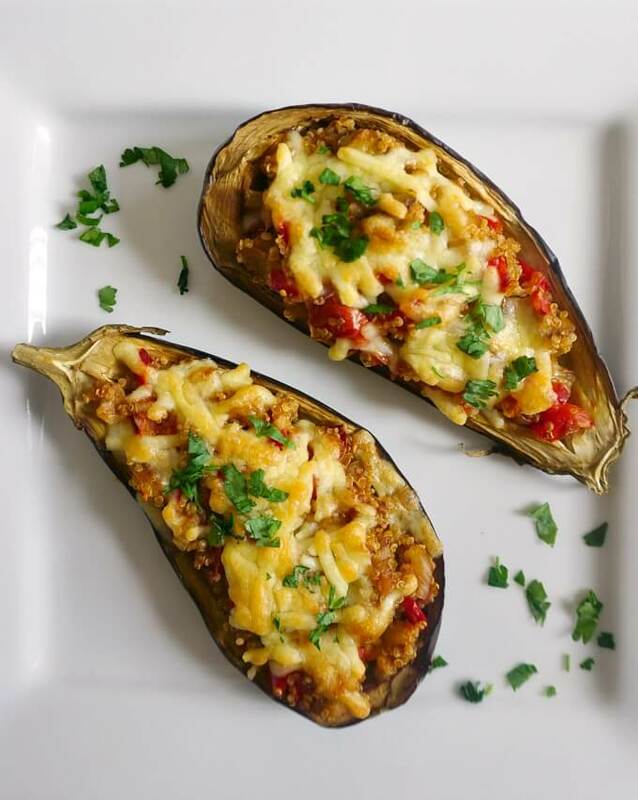 If you’ve liked these HEALTHY STUFFED EGGPLANT WITH QUINOA or any other recipe on the blog, then don’t forget to rate the recipe and let me know how you got on in the comments below, I love hearing from you! You can also FOLLOW ME on FACEBOOK, and PINTEREST to see more delicious food and what I’m getting up to. 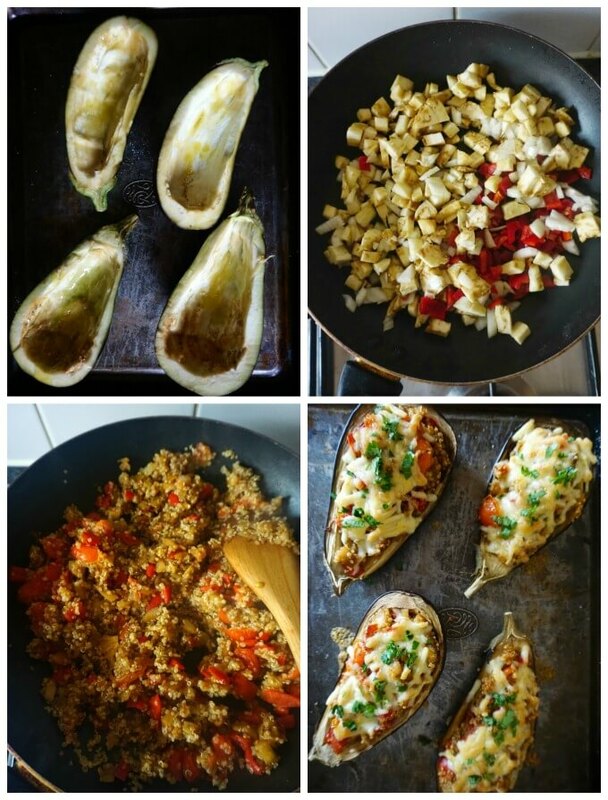 Healthy Quinoa-Stuffed Eggplant. a delicious appetizer that is low carb, low calorie and gluten free. Super simple to make, these stuffed eggplant is a must try. Cut the eggplant lengthwise, then scoop out the flesh, leaving about 1/4 inch around the edges. Drizzle some olive oil over the eggplant skins, then bake for about 20 minutes until they are soft. Chop the eggplant flesh, onion, red pepper and add to a pan together with half a teaspoon of olive oil. Add the vegetable broth and cook for about 15 minutes until the vegetables have softened, then add the chopped tomatoes and cooked quinoa, and stir well. Leave to cook for a further 5 minutes, the liquid should be evaporated, if not, leave to cook for longer, stiring occasionally. Season with salt, pepper and Italian herbs, then take off the heat. Once the eggplant skins are ready, stuffed them with the quinoa mixture, and top with grated cheese. Bake again for 10-15 minutes until the cheese has melted.